European comics artist Miguelanxo Prado describes his two life passions as "listening to and inventing stores, as well as painting." In this adaptation of the classic folk tale by Sergei Prokofiev, Prado combines these passions into a glorious work of art. 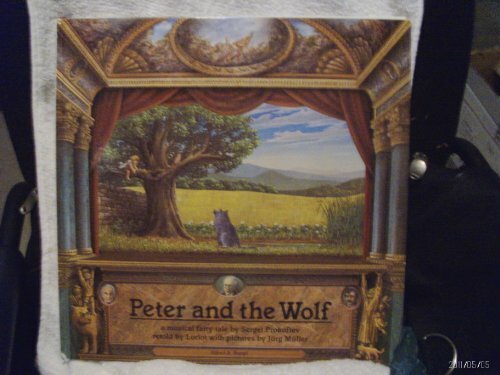 The soft, shadowy colors give this redition of Peter and the Wolf the look of something from another time and place. The book begins with two full-page paintings. The first is Peter, the duck, the cat, and the bird staring into the dark woods; the point of view is from behind them, with the reader staring into the woods with them. Turn the page and you'll see the same scene from the opposite point of view, from within the woods, looking out at them. The depiction is powerfully stirring, and as Prado himself says in his introduction: "While folk tales are usually meant for children, they nonetheless possess a fascinating, evocative power for adults." Whether Peter and the Wolf is for you or your child, Prado's version is a great addition to your bookshelf.